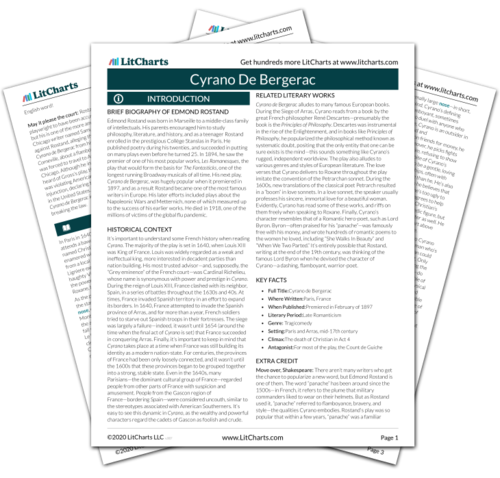 Instant downloads of all 946 LitChart PDFs (including Cyrano De Bergerac). 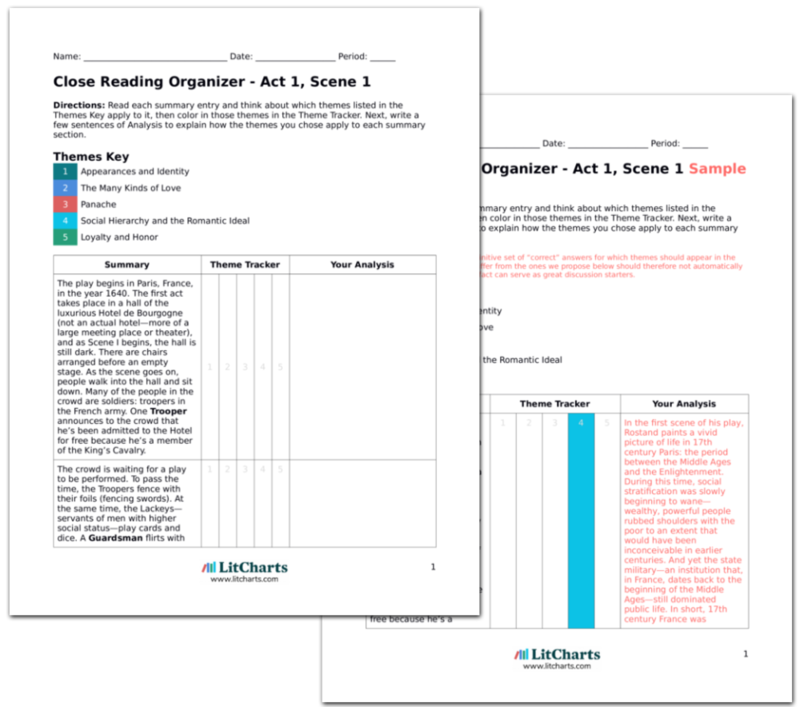 LitCharts assigns a color and icon to each theme in Cyrano De Bergerac, which you can use to track the themes throughout the work. Cyrano is still organizing his thoughts, figuring out how to lie convincingly to Christian without betraying his own love for Roxane—thus, he changes his story almost right away, pretending to be Roxane’s brother, before truthfully admitting that he’s her cousin. This isn’t at all like Cyrano—usually he’s prepared his “story” perfectly. Cyrano explains that Roxane wants Christian to send her a letter. Christian finds this intimidating—while he’s handsome, he’s extremely bad at eloquent speaking and writing, he explains. Cyrano admits that he has the opposite problem: he’s eloquent, but his nose makes him unpopular with women. At first, we’d assumed that Christian and Cyrano would be rivals for Roxane’s love. But now it seems that they need each other: Christian needs Cyrano’s eloquence, and Cyrano would kill for Christian’s beauty. Only by working together can either one of them hope to have a chance with Roxane (or so they assume, at least—neither considers just being honest with her about their feelings). Cyrano then has an idea. Together, he and Christian will woo Roxane. Christian will be the “face,” and Cyrano will be the “voice.” Cyrano produces the beautiful letter he’d written for Roxane earlier that morning. He hands it to Christian and tells him to deliver it to Roxane in Christian’s own name. Christian is confused. Cyrano explains that he always has a letter handy—a letter he usually composes for an imaginary love. Cyrano assures Christian that his letter will apply perfectly to Roxane. Christian is overjoyed with this news, and embraces Cyrano as a friend. It’s a mark of Christian’s dimness that he doesn’t deduce right away that Cyrano is in love with Roxane—he buys the argument that Cyrano, as a poet, always has a perfect love letter in his pocket. We now see the central conceit of the play, which starts here as a “romantic comedy”—a formula still commonly used in movies today, in which someone uses some kind of deceit or trick to win over another’s love, and then that deceit is revealed, and then the two lovers are reconciled. It’s only later that the comedy becomes a more complicated “tragicomedy,” as we will see. Arn, Jackson. "Cyrano De Bergerac Act 2, Scene 10." LitCharts. LitCharts LLC, 21 Mar 2016. Web. 24 Apr 2019. Arn, Jackson. "Cyrano De Bergerac Act 2, Scene 10." LitCharts LLC, March 21, 2016. Retrieved April 24, 2019. https://www.litcharts.com/lit/cyrano-de-bergerac/act-2-scene-10.